So far my usage of AnimationCurves has been limited to animating single float values (for example, controlling the alpha of a color over time). As you can see I'm using 1 AnimationCurve for each axis. My question is: am I reinventing the wheel? Does Unity already provide a Vector3 AnimationCurve set? 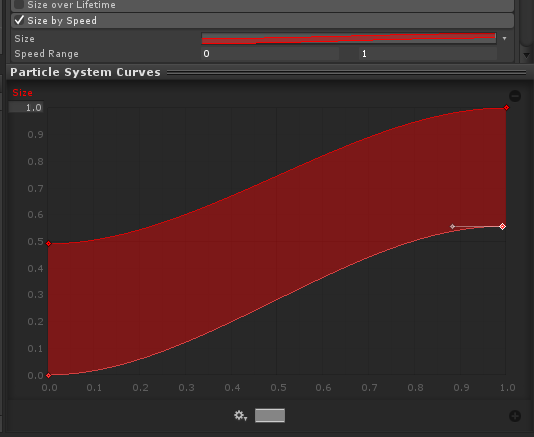 Somehow Shuriken is drawing a custom field for the curves, and is also drawing a custom curve editor. How would I go about drawing curves like this to the inspector? How does shuriken make the extra editor window appear at the bottom of the inspector? 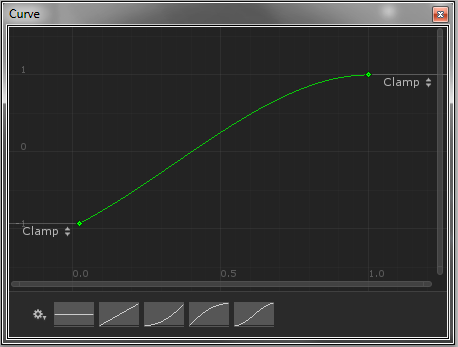 How could I write a custom curve editor to show my 3 curves at the same time? Any solutions for this? Some kind of way to use Shuriken's built-in-graph-system could really change a ton for data driven aspects of my game. Curve editor support multiple curves at a time, but there's no easy way to get it to work from code. You'd need reflection to get and open CurveEditorWindow, get its internal CurveEditor, then set its m_AnimationCurves and probably a dozen other values that Unity normally automates. I ended up writing my own PropertyAttribute and PropertyDrawer to display the curves in the inspector, and then exactly as RudyTheDev says: use reflection to pop open the curve editor. Unfortunately the CurveEditorWindow only supports one curve at a time. It's frustrating, because reading the code in .NET Reflector it looks like Unity would only need trivial changes to unlock this functionality. The linked files won't work - they have a tonne of dependencies you need to track down from the project, would be better if you'd linked to the ZIP file to download the whole project perhaps? Also: you've put a copyright + license on this preventing people from shipping it in their project - this is a nightmare if you ever want to share code, make an asset-store version of your code, etc - so it's not really an appropriate answer to the question (digging in the project, the stated license is currently LGPL, so I guess we could re-write it as an actual library, compile it, package it into a DLL, and then ship it with an asset-store package? But IANAL and this is a rabbit hole :)). On the plus side, the code looks clean (apart from the long dependency chain).